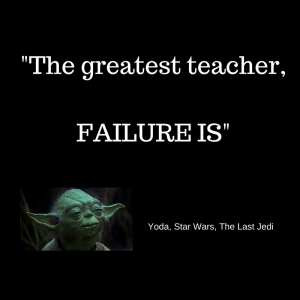 I finally had the chance to see the movie, The Last Jedi and this particular quote about failure resonated with me. Recently, I had an accidental slip with the Whole30 reset and while it was only a minor setback, to me it still was a failure because I needed to start over again. Friday, I was on day five of the Whole30. I waited until after we returned from our holiday vacation because I knew it was going to be challenging to find compliant meals on a road trip. However, the past five days I didn’t find it too difficult to prep and cook three meals a day. I actually enjoyed the process. Shopping for food felt like a fun scavenger hunt where I had to look for ingredients that didn’t include sugar or grains or additives and the list goes on… While it took more time I really like the awareness it gave me, knowing exactly what I was putting in my body. And by focusing more on wholesome food like fruits and vegetables, all types of meats, and nuts/seeds, the process to me got simpler. 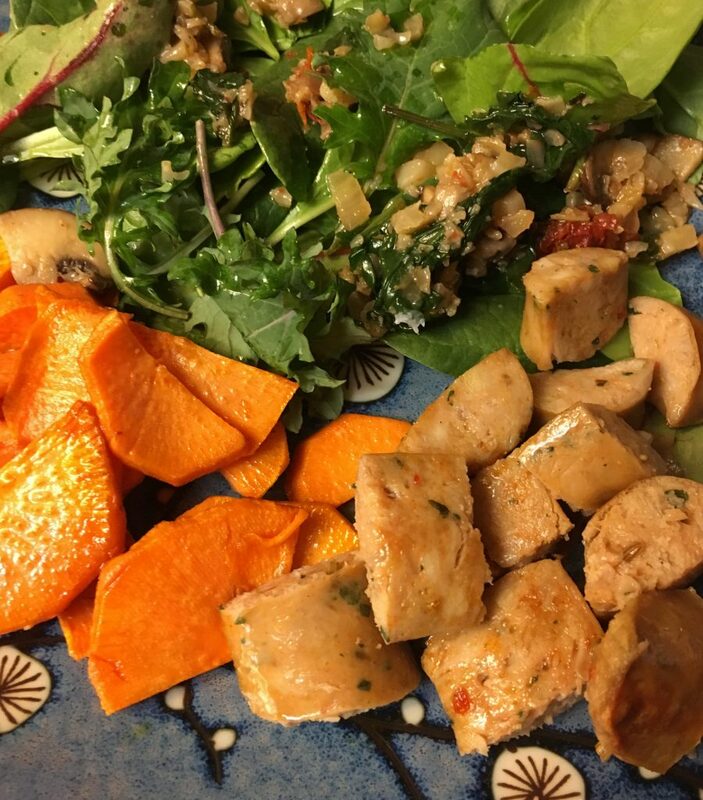 Chicken sausage, pan-fried sweet potatoes in coconut oil, and greens mixed with a little bit of leftover cauliflower rice and mushrooms. You probably would think this is the least appetizing food but I actually love it! 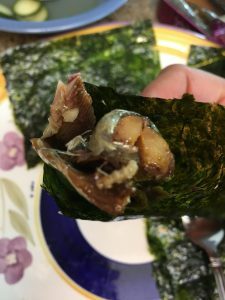 It’s sardines with cucumbers wrapped in seaweed. I’ve eaten sardines since I was a kid so it brought back childhood memories of growing up in the Philippines (unfortunately, the brand of sardines we used to eat there had preservatives :(). Back to Friday, on Day 5 when I decided to go to my favorite coffee shop to finish my graduate course assignments for the week. Usually, I would order a black coffee but I wanted to try a latte with almond milk. Verifying it’s just coffee and milk without second thought the almond milk might contain sugar or other additives. The latte arrived at my table beautifully presented with a little note for an added personal touch. 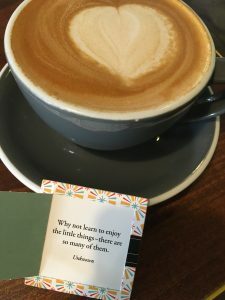 I was ready to enjoy this latte as one of ‘the little things’, but when I took a small sip I felt a sweet rush immediately! This can’t be zero sugar?! It’s way TOOO SWEEEET!! I asked the barista if the almond milk contained sugar to which he responded, only the natural kind. He proceeded to grab the box of almond milk to show me and there it was in the ingredient list. I can’t even remember exactly how much sugar was in it, but I was a bit disappointed. I ordered a black coffee instead and the barista was kind enough to give it to me free on his account. The good news it’s only been five days so extending it five days isn’t much of a big deal. Plus I really don’t mind eating the way I’m eating now. A couple of years ago when I found out I was at risk for becoming a pre-diabetic I took action to avoid processed sugar so it’s not part of my diet anymore. This time around I’m determined to reduce inflammation and hopefully get to the bottom of unusual symptoms I’ve experienced for the past several months. Even if it takes me more than thirty days, I know it’s worthwhile in the end. Eating well is a gain for me! Have you tried the Whole30 or any type of reset? What was your biggest challenge with it? Next postCan We Solve the Obesity Epidemic? Doesn’t it feel good to take charge of your health? After I was diagnosed with RA last year, i made big changes to my diet and I felt so much better! I kind of fell off the wagon at the end of the year, but I’m back on track. Wendy, it’s good to hear the changes improved your RA symptoms! It’s amazing how much sugar is in the food we eat! I like to meal plan but I think I’d be exhausted planning every single meal ahead of time! I’m horrible with meal planning but somehow I’m making it work with knowing what to eat each day. I have not tried Whole30 but will do very low carb when I need to get back on track with my diet. The biggest challenge there is my husband doesn’t usually go along with it, so we are often cooking two different dinners which can be a pain. It definitely helps to have support from your family. Fortunately, my husband and kids will eat whatever I serve them for dinner. I do include a type of grain for my girls though. It sounds like you’ve done really well with the Whole 30 so far. You had just a sip of the latte and were dedicated enough to exchange it for something else – sounds like a win in my book! Thanks Michelle! When you put it that way, it was a WIN!!! Oh no! Sorry to hear about your milk debacle. Isn’t that nuts how we can taste sugar right away when we don’t eat it often (or at all)? I look forward to following your Whole30 journey! Yes it’s interesting the way we can reset our palate. I have heard of Whole 30, but have never tried it. Although you had a tiny accidental “relapse,” at least it was only five days into the program, and not on day 28 LOL A few months ago, I did a 5-day no-added-sugar challenge. It was surprisingly a lit easier than I’d anticipated. I resumed my usual eating habits after those five days, but I’m a lot more mindful of where sugar is hiding within foods. 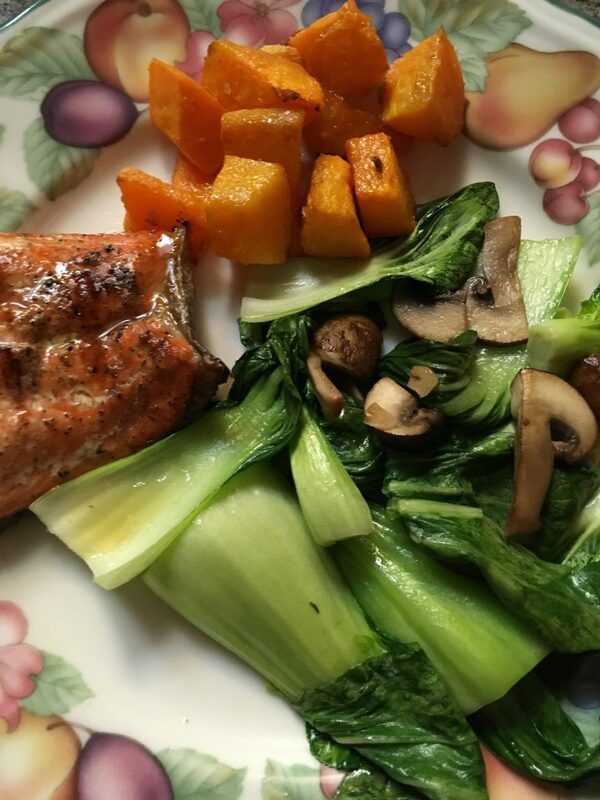 I”ve never done Whole 30 – it’s a little too strict for me personally but I respect everyone who does it! Interesting, I buy unsweetend vanilla almond milk for my oatmeal and it’s tastes sweet to me, but there is no added sugar. So sorry for the setbacks, but you are back into it! I’m not into Whole 30, just because I have a hard time with such overwhelming overhauls to my diet, but a lot of people really love it! Best of luck staying on track! (And I grew up eating sardines, too. I don’t have much taste for them anymore, but I would be willing to try again). I’ve heard of Whole 30 but not ever tried. My diet is semi-healthy but would love to check this out. I liked a lot of things about The Last Jedi, but that quote was one of my favorites! I always notice a huge difference in how I feel when I focus on healthy, nutritious eating. I hope that you continue to find success with the Whole 30 program. It sounds like its working well for you so far, despite the minor setback.